This Husky 300 gallon potable water bladder tank (pillow tank) is the answer to your liquid storage and containment needs. 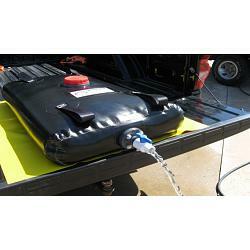 Husky Bladder Tanks range in size from 25 to 50,000 gallons, perfect for water transportation. All Husky Potable Water Bladder Tanks are air pressure tested before shipping, are easy to handle, and fold down for compact, easy storage. HUSKY bladder tanks (also commonly referred to as Pillow Tanks) are widely used in the following industries: agricultural, industrial, commercial, marine, oil, and military. Fitting Sizes from .75" to 6"
Stringent quality control department. All Husky bladders are tagged, signed and dated with inspection labels. Food grade products such as wine, olive oil, vegetable oil, molasses, etc. Storz Fittings 2" to 6"
Note: We may not list all available options for each tank. Simply contact us for your unique needs and we can quote you accordingly! Husky Portable Containment (HPC) will warranty all welds and welded seams on most products for a Lifetime (10 years for bladder tanks). All warranty claims may be reviewed and inspected by HPC to determine if the claim will be honored. Pictures should be sent to to help determine warranty. If it is a repair that can be done by a repair kit then HPC will ship (regular ground) (within the upper 48 states in the USA, outside of the area or country the end user is responsible for all shipping charges which must be pre-paid) a repair kit to the end user for them to apply. HPC reserves the right to refuse any damaged claim due to end user negligence or product abuse. If it is determined to be a legitimate warranty issue HPC that cannot be repaired with a patch kit HPC will either replace the product (shipping regular ground) (all shipping charges outside the upper 48 states in the USA will need to be pre-paid by the end user before a replacement product will be shipped) completely with new or repair the product at HPC facility. HPC reserves the right to determine if the product can be repaired. If the product in question is to be returned for warranty repair HPC will pay only the return shipping costs (regular ground) within the upper 48 states in the USA, outside of the area or country the end user is responsible for all shipping charges which must be pre-paid. The cost to ship the product back to HPC will be the liability of the end user. 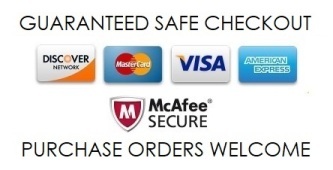 The warranty period will begin at the time the product is delivered to the end user.